“The Truth,” a painting by Michael D’Antuono, was scheduled to go on view Wednesday in Union Square in Manhattan to mark the president’s first 100 days in office. 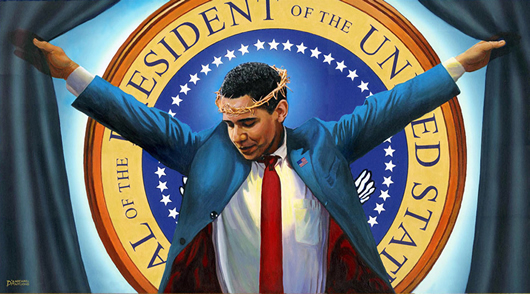 D’Antuono said he has received more than 1,000 e-mails, the vast majority of which criticize the use of Christian symbolism in the painting. Photo: Image of “The Truth,” a painting by Michael D’Antuono. Courtesy of the artist.